Yesterday’s arrival of Kelechi Iheanacho, Wilfred Ndidi, Stephen Eze, Kenneth Omeruo, Ebuhehi Tyrone and Chidoze Awazrem, have increased the number of players in the Super Eagles base, currently being camped at the Ibom Hotel and Golf Resort. As at Monday evening, only seven members of the squad, which include Alex Iwobi, Ogenyi Onazi, William Troost-Ekong, Ola Aina, Elderson Chiejine and goalkeeper Ikechukwu Ezenwa, had arrived the camp before the new addition. The foreign based players had their first training yesterday morning in Uyo. 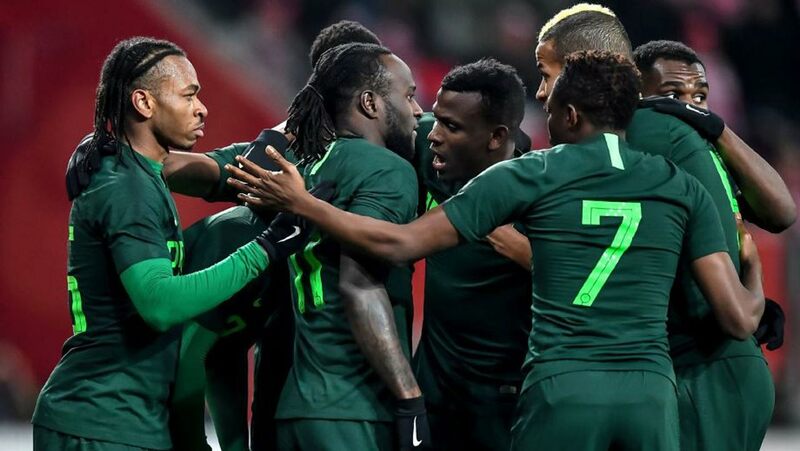 Those on Coach Gernot Rohr’s 30-man list are camped in the same hotel with the home-based stars, who took on the visiting Atletico Madrid in the GOtv MAX Cup held at the Godswill Akpabio Stadium yesterday night. Coach Rohr and his 30-man team will head to Port Harcourt, Rivers State for the friendly against DR Congo scheduled for May 28. Meanwhile, soccer fans in Port Harcourt and its environs are considering whether or not to take the risk of attending the Super Eagles friendly match against the visiting DR Congo next week, due to the Ebola virus that is ravaging the east African country. Although the Federal Government has given the go-ahead for the match, but some fans, who spoke with The Guardian at the Ibom Hotel and Golf Resort in Uyo, yesterday expressed sadness that the Nigerian government would allow the NFF to risk the lives of the citizens against contacting the disease. Facts, however, emerged yesterday on why the NFF is insisting on proceeding with the friendly against DR Congo despite the Ebola scare. A top official of the NFF told The Guardian yesterday at the Ibom Hotel and Golf Resort camp of the Super Eagles that the River State government had allegedly dangled an undisclosed amount of money to an official of the NFF to bring one of the Eagles friendly matches to the city before their departure to Russia. “Some of us are not even aware of what has transpired between the Rivers State government and one of us, as regard the match. I just got the information that Rivers State have promised to release a huge sum of money towards Super Eagles participation at the World Cup if NFF plays one friendly match in Port Harcourt before they leaves for Russia. So, our man didn’t want to lose the money hence he is insisting on proceeding with the match,” the official who pleaded anonymity stated. When contacted yesterday, a board member of the NFF, Chris Green, said: “I am not aware of any huge amount of money… All I know is that our governor (Wike) promised to provide the facilities and make every one comfortable in Port Harcourt for the match against DR Congo.